Well, it’s almost Halloween. But these cookies are everything that is amazing about Halloween. Upon a bit of reflection this week, I came to the conclusion that everything that can be amazing about the holidays is that way because we make them that way. In other words, it will be extra awesome if we add the fun. Enter special sweets to celebrate one of my very fav movies to watch this time of the year. You guessed it, Nightmare Before Christmas. 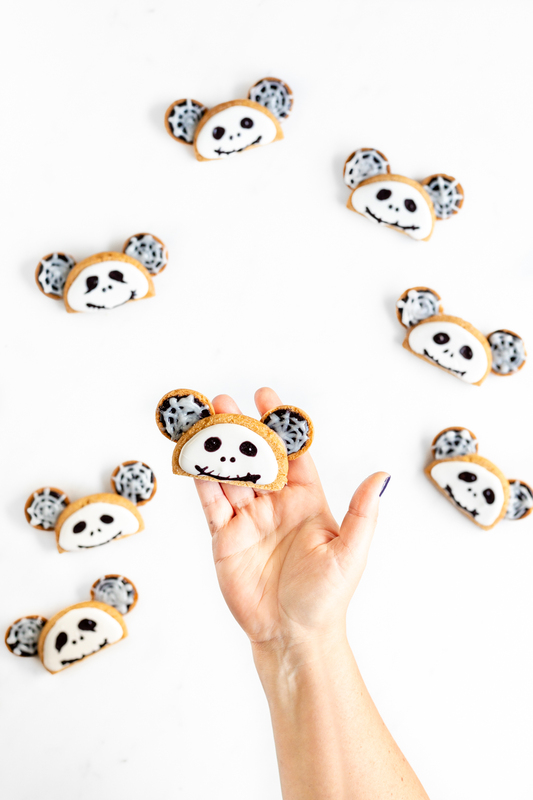 I have been wanting to make these Jack Skellington Mickey Ears Cookies and I’m stoked that I finally got em’ done in time for one of my very favorite holidays. 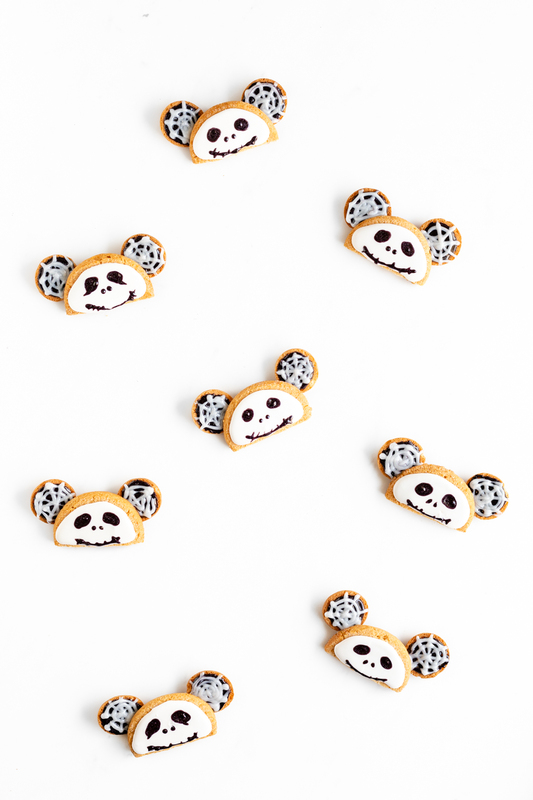 If you love the movie and Disney in general, these cookies are made just for you. You totally get it. If you don’t get it, maybe taking a visual of these real JS ears on Pinterest will help. Part of my favorite thing about visiting Mickey’s Not-So-Scary Halloween party at Magic Kingdom each year is seeing the fun themed Mickey Ears for Halloween. So many cool and even creative DIY ears to see. These cookie creations are so very easy to make and require absolutely no baking. With store-bought sugar cookies and vanilla wafers, we can bypass firing up the oven. Can I get a whoo, hoo here? These are also great to let the kids make, too. That is totally it. Seriously. First, cut off about 1/3 of each sugar cookie and use the extra bits for another use. Since your cookie size could vary, you will have to eye it to get the right size. The goal is to leave a good amount of space to create Jack’s faces onto and it will be a little more than half the cookie to do it. Add the cookie icing to each of the 8 cookies. Use the black sparkle gel to add Jack’s face including oval shaped eyes, tiny nostrils and a jagged mouth. 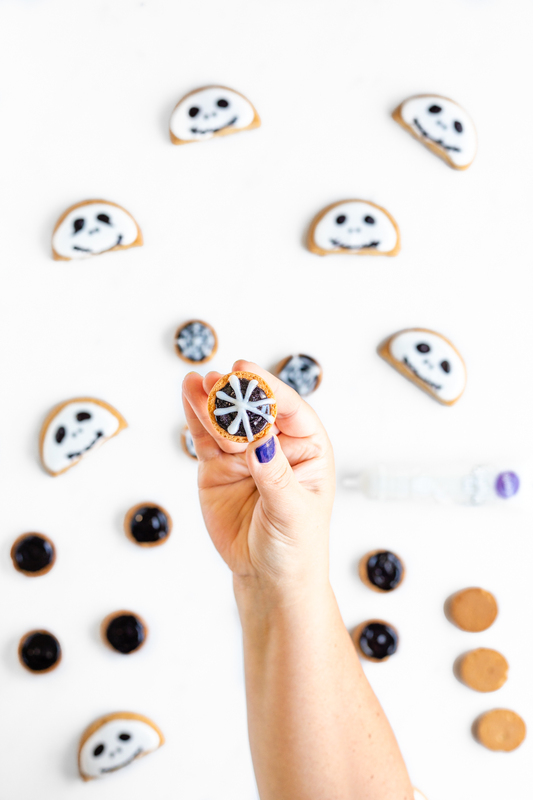 Put the cookie faces aside to dry. Prepare the ears but covering the vanilla wafers with black spark gel. Then, carefully create a spider’s web using the white sparkle gel. Start by making an x shape and then two more equivalent lines in another x shape. Carefully start from the center and create a swirl that gets larger until you fill the cookie space to create the look of a web. Then, on a large baking sheet, very carefully place the cookie faces on top of two cookie ears. Make sure to place the face base on top of the ear’s icing to seal the deal. Finally, these need to set without being touched for about an hour before serving. Once the icing is all dried, the ears will be attached to the faces for the cutest little cookies. Eek. That’s it! 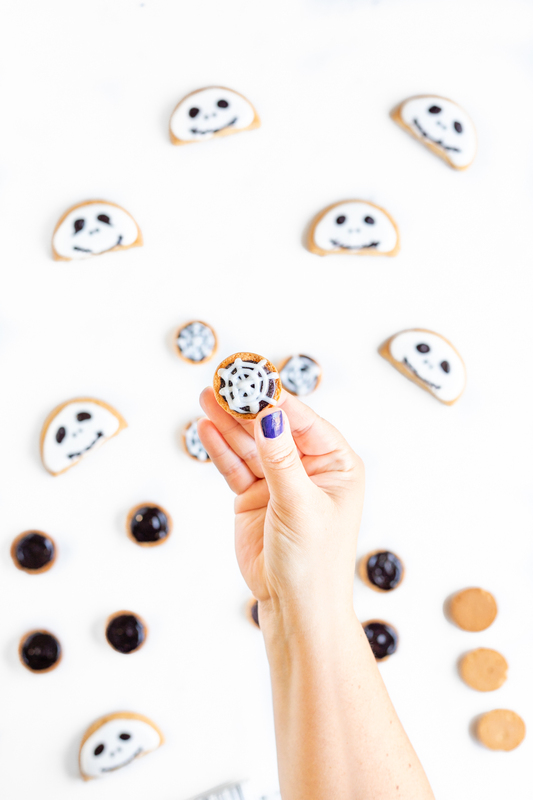 You now have super duper cute Jack Skellington cookies with no fuss, just fun! First, cut off about 1/3 of each sugar cookie and use the extra bits for another use. Since your cookie size could vary, you will have to eye it to get the right size. The goal is to leave a good amount of space to create Jack’s faces onto and it will be a little more than half the cookie to do it. Add the cookie icing to each of the 8 cookies. Use the black sparkle gel to add Jack’s face including oval shaped eyes, tiny nostrils and a jagged mouth. 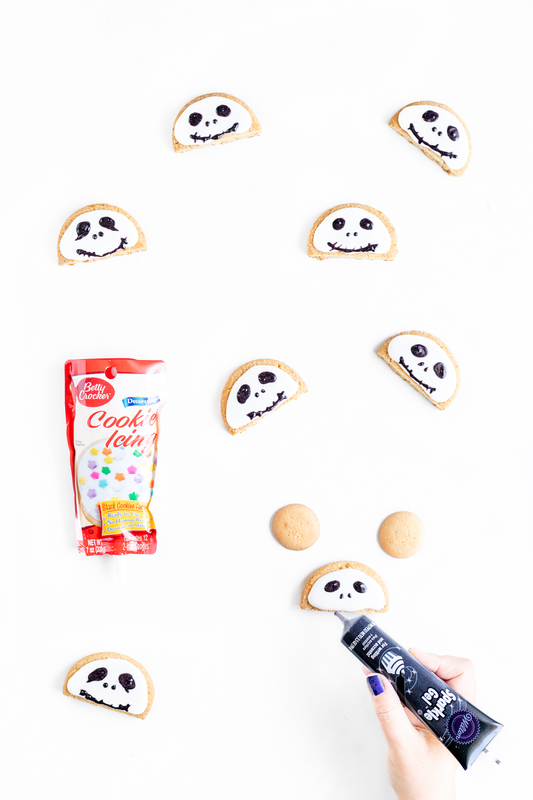 Put the cookie faces aside to dry. Prepare the ears but covering the vanilla wafers with black spark gel. Then, carefully create a spider’s web using the white sparkle gel. Start by making an x shape and then two more equivalent lines. Carefully start from the center and create a swirl that gets larger until you fill the cookie space to create the look of a web. Then, on a large baking sheet, very carefully place the cookie faces on top of two cookie ears. Make sure to place the face base on top of the ear’s icing to seal the deal. Finally, these need to set without being touched for about an hour before serving. Once the icing is all dried, the ears will be attached to the faces for the cutest little cookies. Want more Jack? 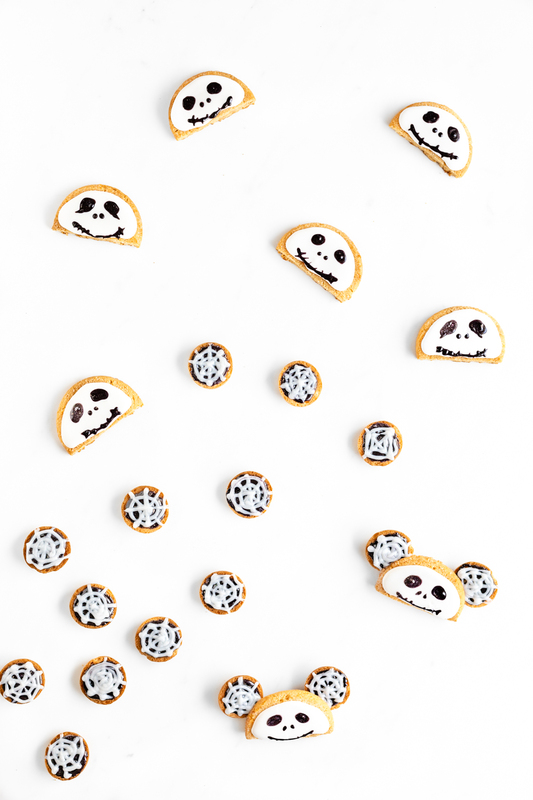 Check out the special Jack Skellington treat you can find at Mickey’s Not-So-Scary Party this year. Want more Disney inpspired recipe ideas? Check out my Minnie Potion Purple Cookies.